The plastic worm is the greatest bass lure of all time, but fly fishers have no pattern to match it—until now. Tie the Darth Baiter, and let the force be with you. NO FISH CAN RESIST THE SEDUCTIVE WIGGLE, translucent color, and lifelike texture of plastic worms. The problem for fly tiers is that there are no natural materials that duplicate these attributes. Many tiers, including myself, have tried creating worm flies using saddle hackles, rabbit strips, and many varieties of chenille with varying degrees of success, but we have never completely mimicked plastic worms. They say if you can’t beat them, join them, but we can beat conventional-tackle anglers at their own game. You just have to take a step toward the dark side. I’m not saying to use a Senko worm with your fly rod, or to put your long rod away and use casting tackle. I am suggesting that you make a plastic worm for your fly rod. As synthetic materials became more widely accepted, it was just a matter of time until someone figured out how to imitate a plastic worm. It started with the chenille San Juan Worm, but today we have the Squirmy Worm. Next, Spirit River Products came out with Jumbo Squirmy Wormies, which are a bass-bugger’s dream. These 3-inch-long, 1/4-inch-thick worm bodies are ideal for making bass bugs; you could say they come from the dark side of fishing. Say hello to Darth Baiter! Is the Darth Baiter actually a fly? 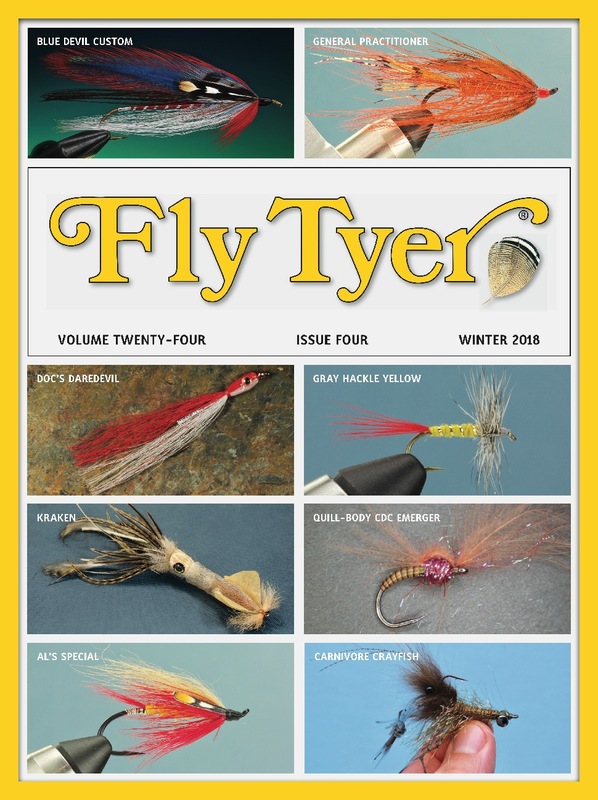 Since every material in the pattern is purchased from a fly shop or fly-tying catalog, I think it is; I just put them together in a new combination. Now we have a pattern that truly matches a plastic worm. The Darth Baiter wiggles and slinks like a plastic worm, is tied weedless so it can slide through the thickest cover, and the weight is adjustable so you can fish it at any depth. The Darth Baiter is easy to cast, and you can repair the fly if the tail becomes damaged or lost; as long as you don’t lose the head of the fly, you can replace the plastic tail. Let me tell you a little story about how well the Darth Baiter really works. I have a friend who owns property containing an awesome bass pond. My buddy is a very accomplished gear fisherman who wanted me to teach him how to fly fish for bass. By the time we got to his pond, weather conditions precluded any successful top-water fishing and we had to fish down deep. My friend was not comfortable throwing a full sinking line, so he reverted to his casting gear. He rigged his tackle with a 10-inch-long plastic worm, and promptly announced, “Let me show you how it’s done.” I just tied on my Darth Baiter, accepted the challenge, and smiled. We both caught a lot of bass that day, but the Darth Baiter caught far more fish, including the largest of the trip. Needless to say, I was pleased and he was impressed. The Darth Baiter is a very versatile fly that can be fished many ways at any depth. With its double monofilament looped weed guard, you can throw it into weed beds and log piles. With the interchangeable weight, you can remove all the weight and fish the Darth Baiter over the tops of thick grass or lily pads as a surface fly, and twitch and slither it like a swimming snake. Use a floating fly line and a little weight, and fish it mid-depth similar to a plastic fluke, twitching it from just under the surface to a few feet down. 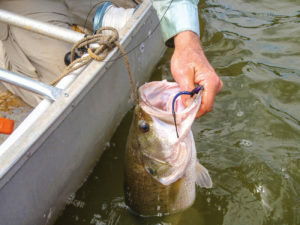 Do the same with an intermediate-sinking line to fish deeper yet retain a slow rate of decent; this technique works great alongside docks or around standing timber for suspended fish. Adding more weight turns the Darth Baiter into a jig fly. The Darth Baiter will quickly penetrate into weed beds or log and rock piles, tempting any bass living in these structures. A snappy retrieve with pauses draws strikes when the fly jumps off the bottom. This works well down to a depth of five or six feet, and it is better than using a sinking-tip or full sinking line. A full sinking line works best when the wind blows or you want to get down deep by creek channels, deep humps, or points. The new Rio In-Touch line excels at this. It casts easily, even into a wind, and it is weighted heavier in the tip, giving the entire line a more uniform sink rate that keeps you in contact with your fly. Another bonus is that it has a non-stretch core so you can detect even the slightest strikes. I prefer using a 10-foot-long rod for easy line mending when fishing rivers, and a 9-foot rod for most flat-water fishing with a floating line. However, I do better with 7 ½- to 8 ½-foot-long rod when using a sinking line, especially when fishing from a boat. I have a better sense of touch and line control when I point the shorter rod toward my fly with the tip in the water. I can also strip strike much better using a short rod; if I absent mindedly pull the rod a little sideways on the strike, I don’t have a long soft tip dampening my strike. Ironically, I tend to use less weight on the fly the deeper I fish. I rely on the sinking line rather than the weight of the Darth Baiter to get into the strike zone. Little or no weight with a sinking line allows the fly to bounce off obstacles and not drag through the mud or weeds on the bottom. Sometimes adding a floating Boobie Barbell Eye helps keep the fly off the bottom. Regardless of how you present the Darth Baiter, the feel of a strike can vary. The strike can be very subtle as the line just grows tight or feels heavy, sometimes it’s a light tap-tap, and then other times a fish hits with a hard pound. No matter how a bass strikes, respond with a swift strip strike or two to set the hook. If you miss the fish, just pause for the fly to sink back to the bottom and then continue the retrieve. There is no wrong way to fish the Darth Baiter, just as there is no wrong way to fish a plastic worm. Whether the fly is weighted or un-weighted, or you use a floating or sinking line, bass will find the Darth Baiter desirable to eat. Now go and let the force be with you! Craig Riendeau is a regular contributor to our magazine. 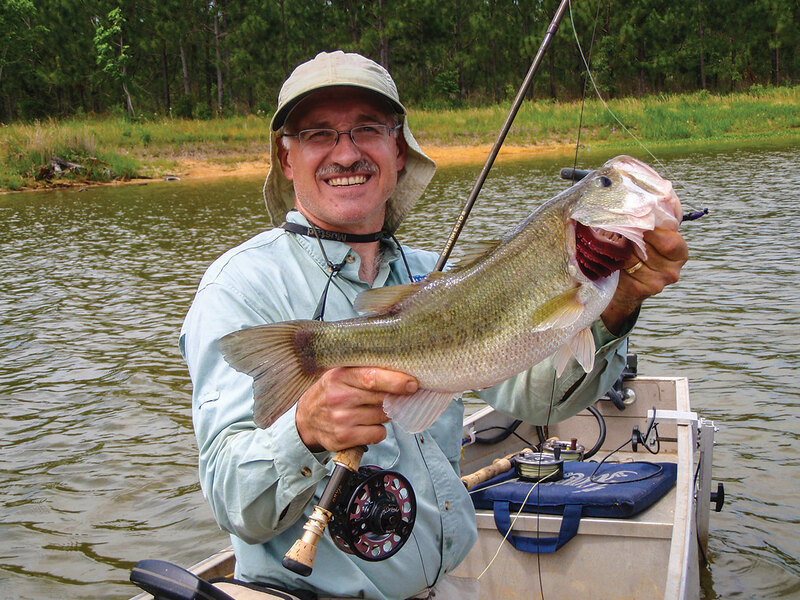 He is also an expert guide who specializes in catching bass and panfish in his home state of Georgia. For more information, go to his website, www.offthedeepedge.com. Hook: Gamakatsu B10S stinger hook, size 2 or 2/0. Head (optional): Petitjean Magic Head. Weight: Riendeau Ringer with a dumbbell eye. and 20-pound-test hard monofilament for size 2/0. Rainy’s Float Foam, and Sili Legs. Tail stem: 20-pound-test hard monofilament. cement, and Component Systems Quick Coat Worm Dip.